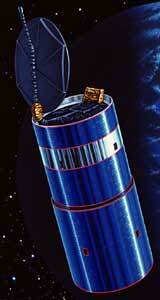 June 1994 signaled yet another high point in the history of the Hughes HS-376 satellite model. Broadcasting Satellite System Corporation of Tokyo (B-SAT) contracted with Hughes Space and Communications International, Inc. (HSCI), to purchase two HS-376 B-Sat (Broadcasting Satellite) satellites, designated BSAT-1a and BSAT-1b, and launch services. The spacecraft were to provide broadcast services to more than 10 million customers throughout Japan via NHK (Japan Broadcasting Corporation), WOWOW (Japan Satellite Broadcasting, Inc.), and others. The satellites provided four-channel viewing capabilities to homes with small, low-cost dishes, making the BSAT-1 system environmentally friendly as well as affordable. BSAT-1a and -1b replaced the two BS-3 spacecraft used for DBS services, including Hi-Vision test broadcasts, by NHK, WOWOW, and others. Hughes selected the Ariane rocket as the launch vehicle for the BSAT-1 spacecraft. BSAT-1a was launched 16 April 1997 from the Guiana Space Center in Kourou, French Guiana. BSAT-1b was also launched from Kourou on 28 April 1998. The two satellites are located at 110 degrees East longitude. Stowed for launch, BSAT-1a and -1b are 3.15 meters high and 2.17 meters in diameter. As the satellite moves into its on-orbit test position, its solar panels are extended and the reflector is raised, bringing the satellite height to 7.97 meters. The solar cell output at the beginning of life is 1200 Watts. The 106 watt traveling-wave tube amplifiers (TWTAs) are a key to the 10-year life and high performance of the BSAT-1 spacecraft. The BSAT-1 TWTAs are based on the reliable, long-life TWTA first qualified by Hughes' Electron Dynamics Division, now known as Boeing Electron Dynamic Devices, Inc., in 1992. Each spacecraft has four active and four spare high-power transponders in Ku-band. EIRP coverage over Japan will be equivalent to those of BS-3. The BSAT-1 spacecraft design meets performance requirements with approximately 6 percent power margin at end of life. HS-376 spacecraft have historically provided more than 100 percent of the required power in orbit. The spin-stabilized HS-376 spacecraft consists of two main sections. One is the spinning section, which contains the apogee kick motor, power system, secondary propulsion, and most of the attitude control and the command and telemetry subsystem elements. The fully redundant subsystem controls and monitors the spacecraft through all mission phases. The secondary propulsion subsystem controls spacecraft orbital velocity, inclination, attitude, and spin speed. The other main section of the spacecraft is the despun portion, which houses the customized communications payload, including the transmitters and receivers. Commands are received at 17 GHz, and telemetry is transmitted in the 12 GHz band. On station, the satellite transmits and receives data through the communications antenna. The BSAT-1 design incorporates an advanced new lightweight shaped reflector with a single feed for communications traffic, and auxiliary feed horns for tracking. The precision antenna pointing system, proven on previous Hughes 376 satellites, maintains an antenna pointing accuracy of better than 0.05 degrees. All HS-376 models have two telescoping cylindrical solar panels. These panels and the deployable antennas are stowed for compactness during launch. The highly reliable design makes full use of the advanced nickel-cadmium battery developed by Hughes to maintain uninterrupted broadcasting during eclipses. The solar panels use large area solar cells similar to those proven on previous Hughes 376 spacecraft. The 376 design minimizes the number of required mechanisms and has never had a deployment failure.